Kildare Stables is a full service facility owned and operated by Thomas and Madeleine Duggan. Kildare Stables is located about 1 1/2 hours drive North of Manhattan in Dutchess County, Millbrook, NY. The farm is located right in the center of the Millbrook Hunt country. Kildare Stables operates as a boarding and sales facility with 40+ horses in training. We offer training for both horse and rider and accommodate riders of all levels from the advanced to the beginner stages. The staff at Kildare Stables are always energetic, enthusiastic, and knowledgeable in their field. The success of the barn over the last 25 years is mainly credited toward maintaining the specific requirements of both horse and rider. Thomas and Madeleine Duggan are both from Europe. Owning to their Irish and Danish backgrounds they have a wealth of international experience between them. Thomas a former student of the Irish Equestrian School, competed successfully in Ireland and internationally, before coming to the States more than 20 years ago. He set up Kildare Stables - a training facility and import of Irish Sport horses. His goals and success has always been matching horses to riders of all levels, from the upper level event horse to the amateur hunt horse. Madeleine brings a dimension of competition and brings forward the young imported Irish event horses and ponies. She has developed a large group of junior riders, who are avid fox hunters, but also excel in the eventing world. Her junior riders are very successful and have qualified and competed at the United States Eventing Championships for the last number of years. Both Thomas and Madeleine have more than 20 years experience teaching children and adults of all levels. We cater to the weekend rider, who enjoys ring lessons, x/c riding and hunting, as well as the competitive event rider. Please check our eventing schedule under Eventing. Kildare Stables has an excellent selection of school horses and ponies for our clients initial riding at our farm. To inquire about lessons, please call the stable at 845 677 9320. Thomas Duggan began his career riding and hunting in Ireland, and brings with him a wealth of knowledge of the sport. 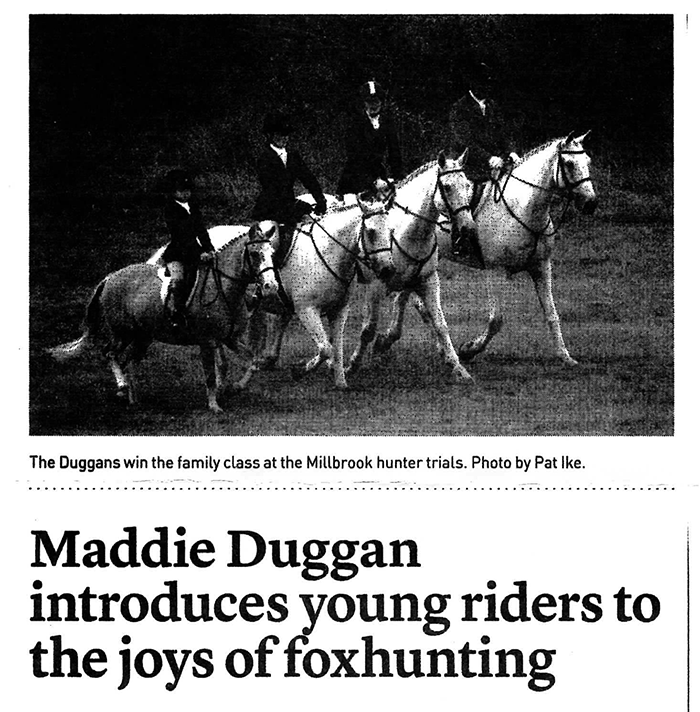 The Millbrook Hunt was founded in 1890's and is widely known as one of the premier equestrian organizations in North America and has been a fixture in Millbrook for more than 100 years. Kildare Stables is located in the midst of the Millbrook Hunt country and 10 minutes from the Millbrook Hunt kennels. Kildare Stables is very active in the Millbrook Hunt and we participate in all the hunt related events, including trail rides, hunter paces, hunter trials, and hound and puppy shows. Competing is a regular part of riding at Kildare, especially for our junior riders, but also for our adult amateur riders. Some of our riders will start competing at local shows, while our seasoned junior riders and adult amateurs attend recognized events from the BN level to Preliminary. We compete primarily in area 1 spring, summer and fall, and spend the winter hunting and eventing in Aiken, South Carolina. Please contact Thomas Duggan 845 797 4785.